Apparently I have a tendency to talk about things I'm going to cook or bake without getting around to it for months, sometimes up to a year. 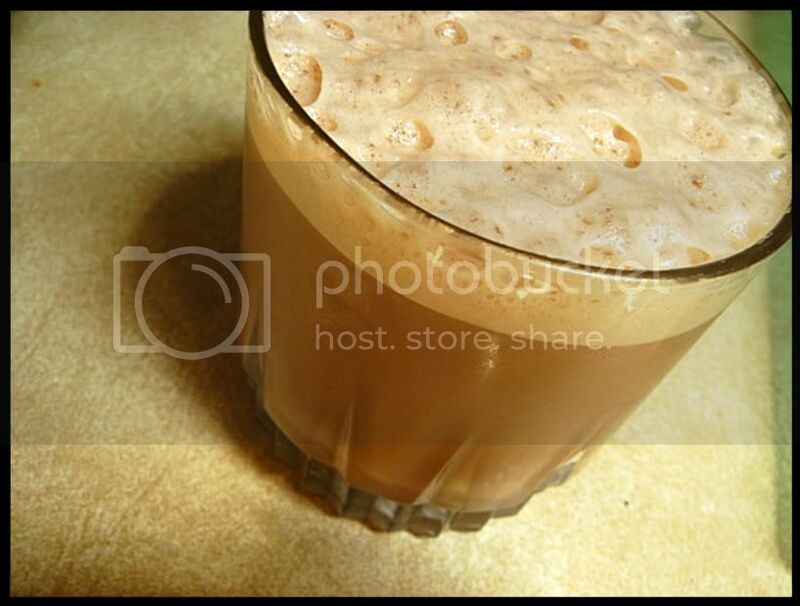 Cold-brewed coffee is one of those, and it's completely unacceptable since it's a snap to make. 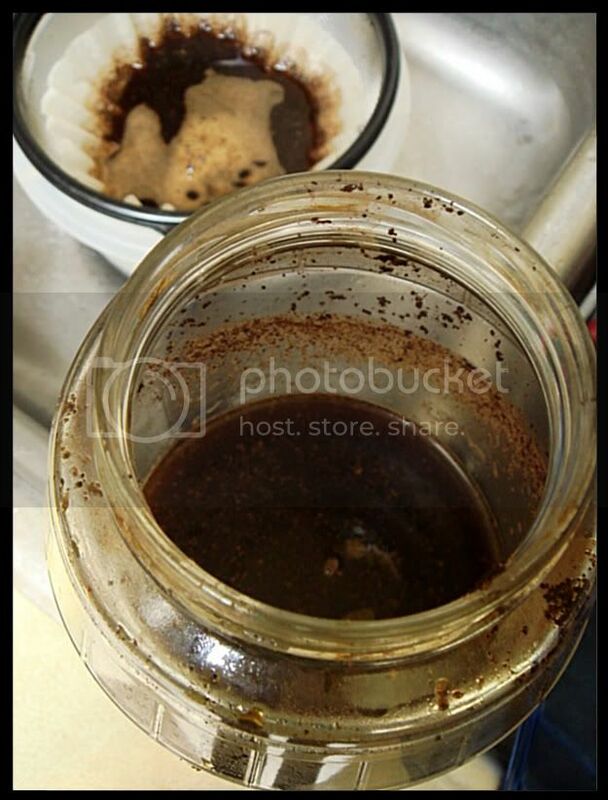 Stir coffee grounds into water, place jar on a counter for 12 hours or overnight. It's also what I order when I go to Borders, a cold-brewed vanilla latte. Note, this won't have the same taste as an iced vanilla latte which has espresso shots, but I like it so go away. Many people might say that cold-brewed coffee is a stupid concept, none of the bitterness and something around 90% of the flavor opposed to a shot of espresso poured over ice. I never really pay attention to how long it actually it actually brews as I prep it and leave it on the counter if I make it early in the day/afternoon, then place it in the fridge overnight, though I think it comes out fine. 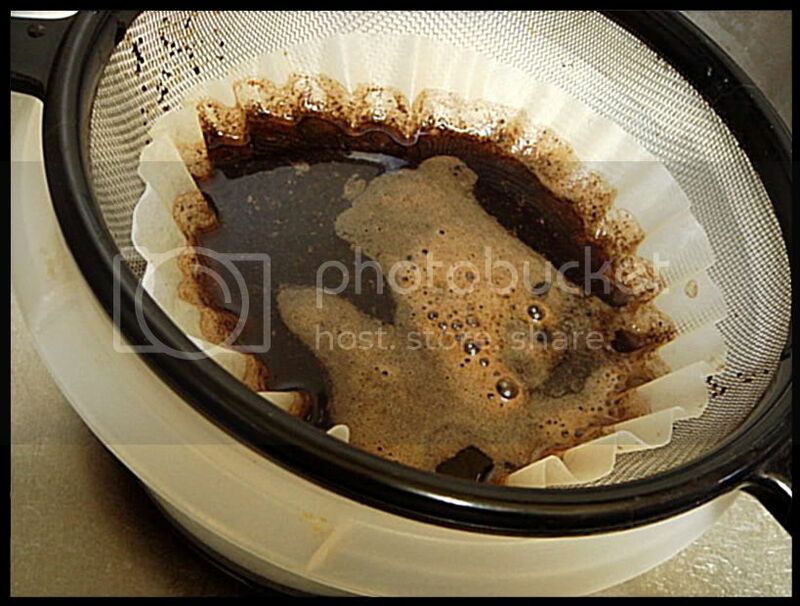 Strain twice through a coffee filter placed in a sieve. Coffee is my joy in life. I love it, I love everything about it. I love complaining if the coffee is too bitter and acidic, I love to look at the color. I love waking up in the morning, snapping off the comforter, jumping out of bed onto the floor and with arms raised in jubilation scream, "COFFEEEEEEEEEEEEE!". Much to the chagrin of my cats, I might add. "Folgers in my cup!" is my favorite commercial. If I like you, I might pelt you with chocolate-covered espresso beans. 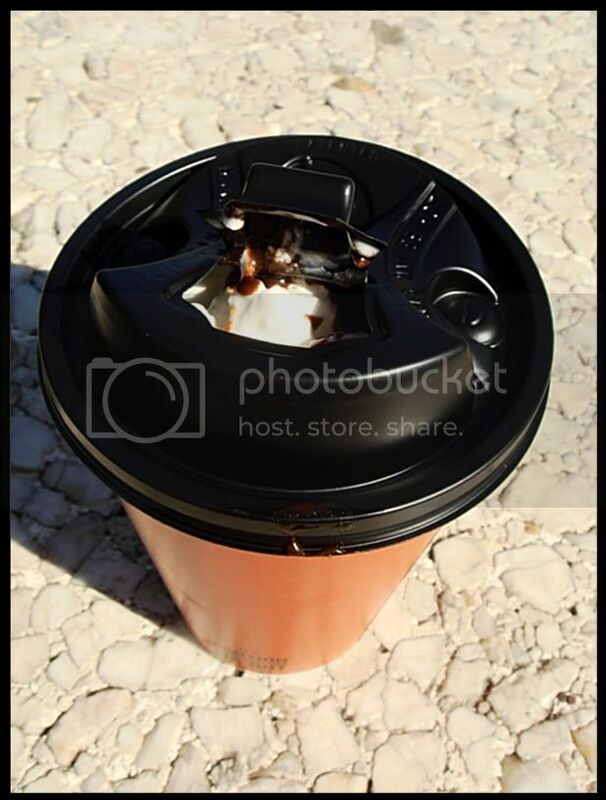 I feel sad when I look into the cup and instead of a dark brown liquid seeing white. 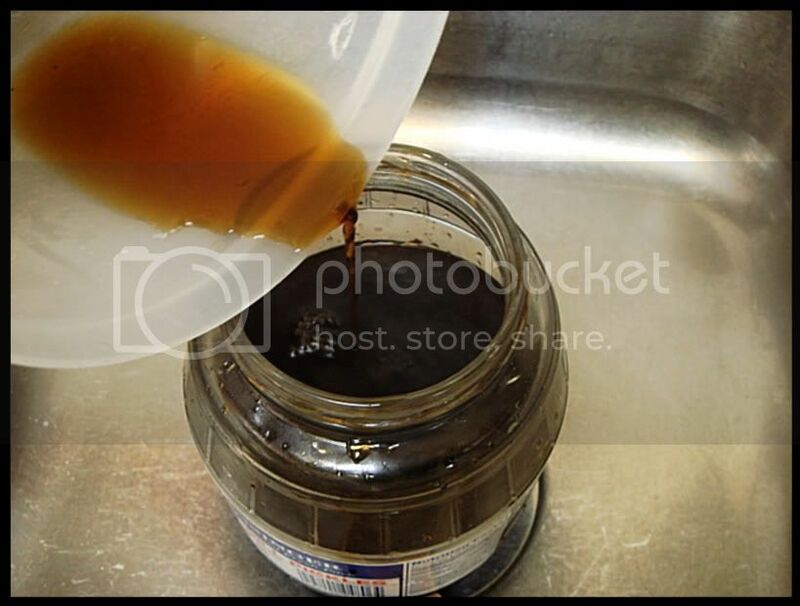 This process makes a concentrate that can be diluted with 1:1 ratio of concentrate to liquid, either water or milk. You can also make ice cubes. What I do for a "latte" is to mix 2/3 cup coffee concentrate (note how I use more coffee) and 1/3 cup milk, then I pour it into a small jar along with some vanilla syrup and shake it up really well so it's frothy for a brief moment. 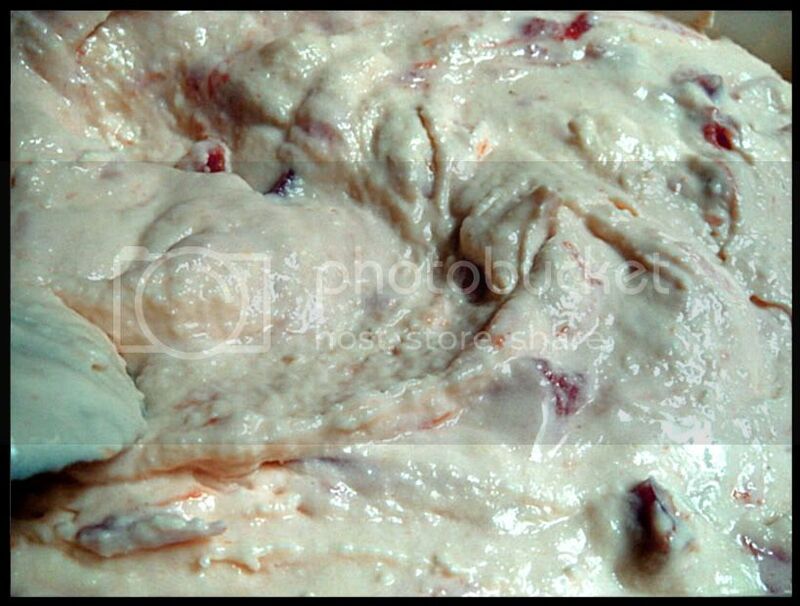 I never realized it was possible to make ice cream without a machine, either because I'm stupid or because I never looked into it more deeply than an afterthought. 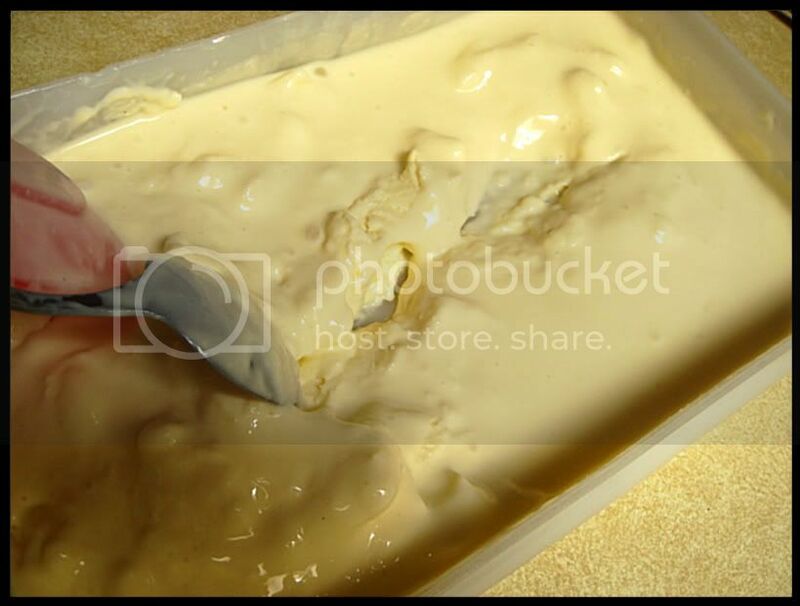 Whatever the reason, a visit to David Lebovitz' blog where I found a method to make ice cream without a machine, I did a back flip and screamed for ice scream. I don't have any pictures of this. This isn't actually the first ice cream I made as I tested it out 4th of July weekend with spectacular results (and you can substitute the heavy cream with evaporated milk...), an orange-flavored ice cream with melted chocolate added close to the end of the "churning" process. My next flavor needed to be something completely different than what I'm accustomed to making, and I used this opportunity to make a peach flavored ice cream for my brother, with what was supposed to be a hint of mint in the background. 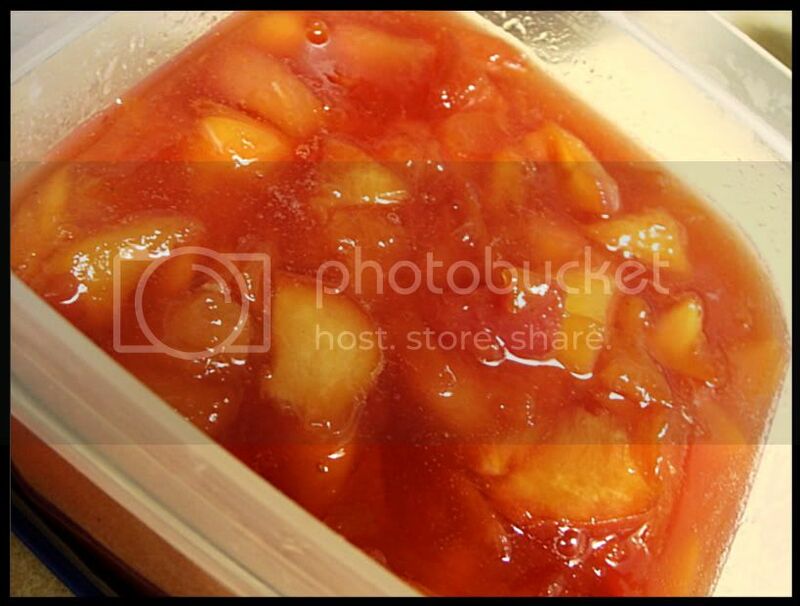 The chosen recipe was the same as last time from Martha Stewart's Cooking School: Lessons and Recipes for the Home Cook for the custard base, and the peach jam for the peachiness. Giving step-by-step instructions so you cannot fail unless your inherent trait is fail, you cannot go wrong with this recipe. I chose it because it was a custard, including eggs, and therefore richer. I used heavy cream this time, but replaced the skim milk with whole milk for even more richness. 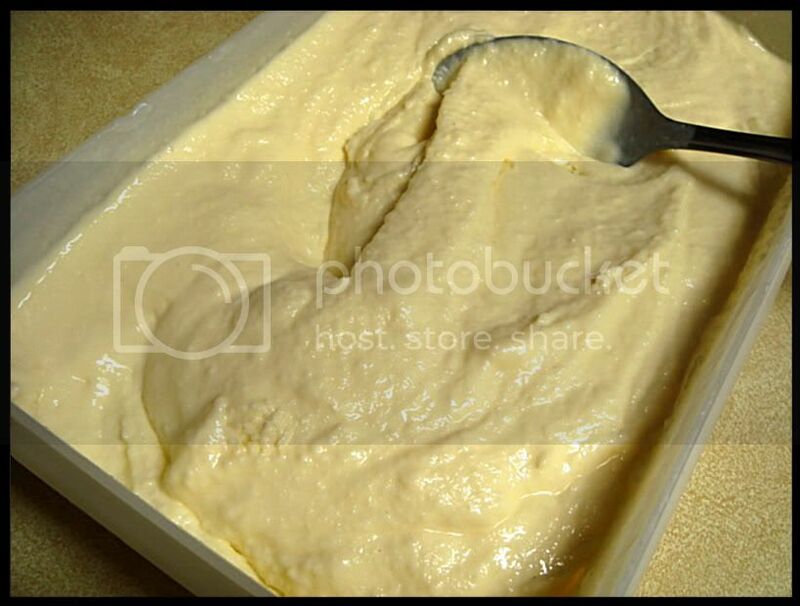 A little tip, the custard is supposed to be more liquidy than what you might think a custard to be, but it will coat the back of a spoon. So the first step is to heat the moo juice with some of the sugar, then remove from heat and steep the flavoring for 30 minutes. A word to the dumb: Don't steep mint for 30 minutes unless you want what tastes like undertones of rye. I figured maybe it was just me, but my brother commented on it. And I smushed his bowl in his plate and insulted is palate. Kidding. 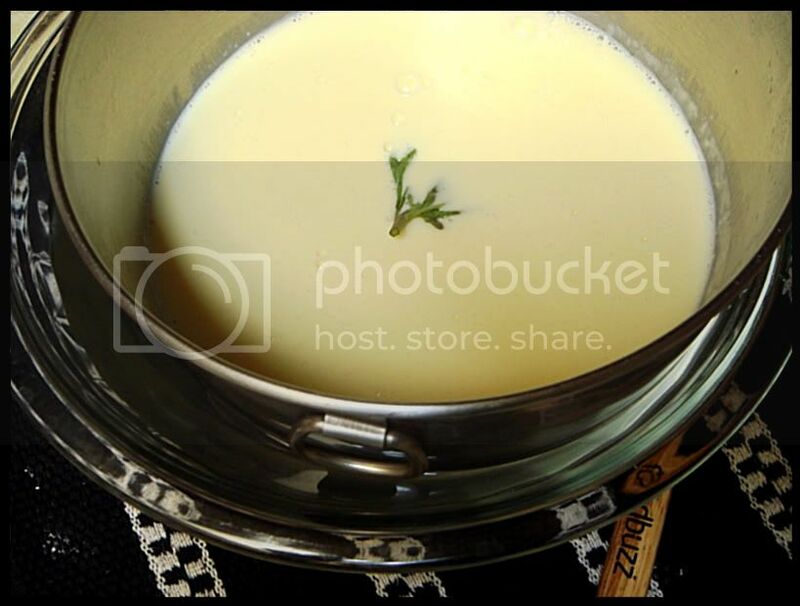 The better way to steep the mint is to put a few sprigs in after the entire custard has finished, for 5-10 minutes. Unfortunately, while the mint flavor came through this time (I didn't feel it was enough to come out against the peach the first time), it was very strong. Whoops. 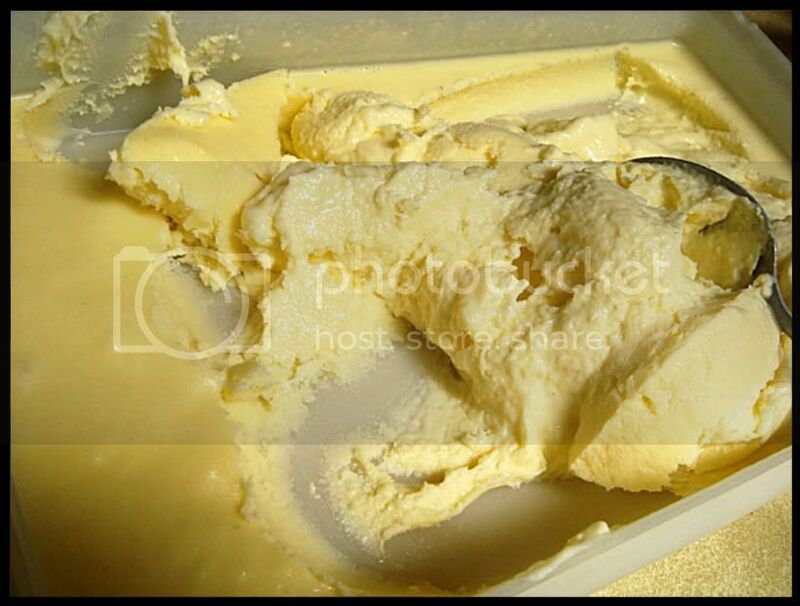 As all ice cream recipes will instruct you to chill the custard in an ice bath prior to churning, I don't have ice. You could instead place it in the fridge overnight, but I hadn't any patience. What I did was place the custard bowl in a bowl of really cold water, changing the water whenever it became warm. 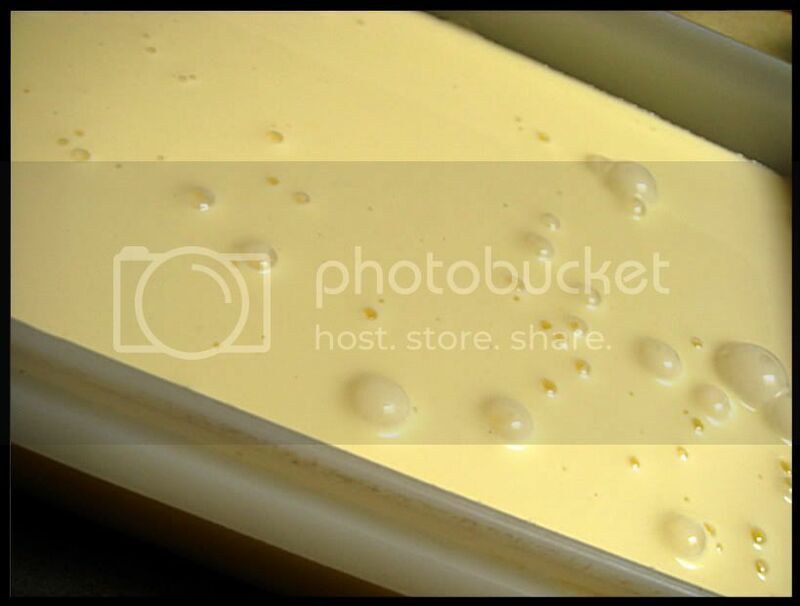 Next step is to place the cold custard in a shallow container and place in the freezer. After the first 45 minutes this is what it will look like. 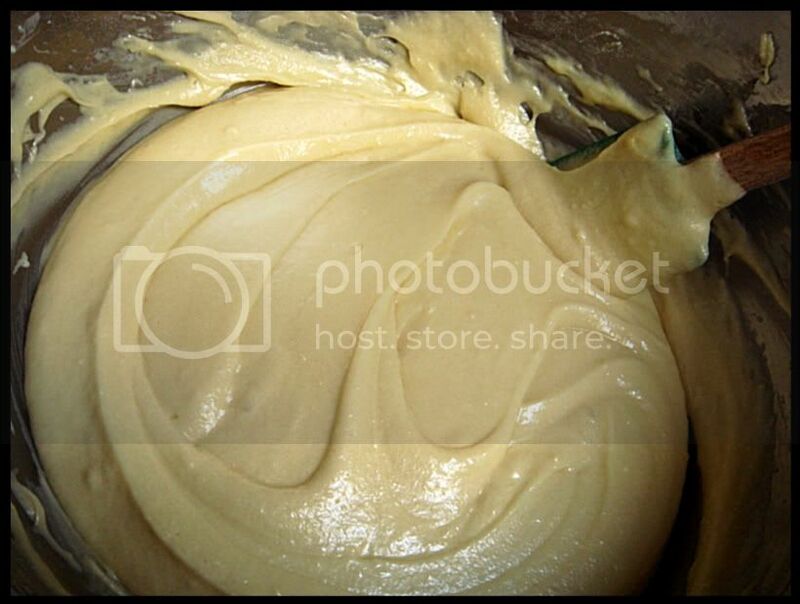 Since you don't have a machine, you'll want to really get in there with a sturdy spoon or spatula and mix it all up, churning with the strength of your own arm, breaking up any frozen particles to emulsify the mixture into something evenly smooth. The freeze-and-mix process continues every 30 minutes for 2-3 hours, as per Lebovtiz' instructions. The top picture is what it looked like after one of those, I think nearish the beginning, I'm sorry but I forgot precisely. But it shows how my freezer has a cold spot, so I turned the container at the halfway point. The second picture illustrates how I broke down the frozen parts and blended it all back together; you can also see the difference in texture from the first picture. Take your time and don't rush the process. 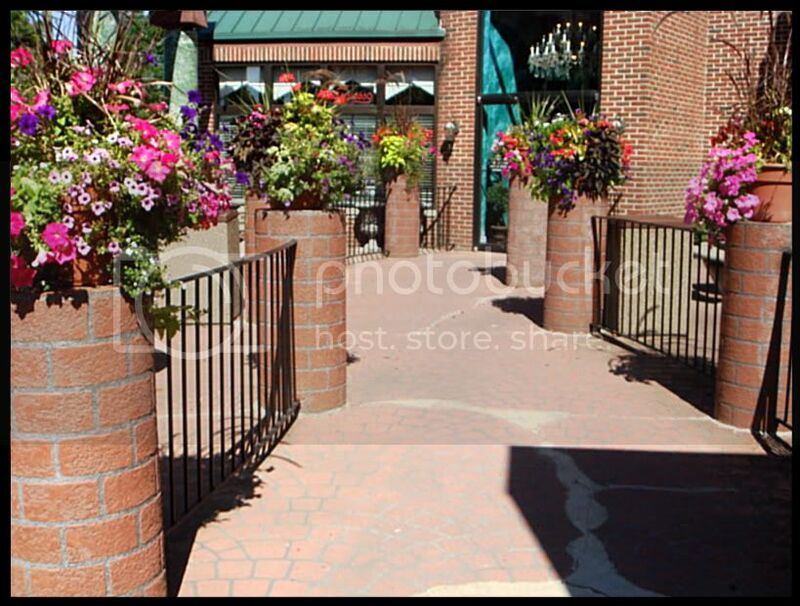 And finally, it'll look something like this at the end. As per normally, homemade proves to be better than many pre-made products. My one brother liked how it seemed richer and more dense than most ice cream, which makes sense considering less air was probably mixed in, not entirely unlike gelato. Next time I want to try a recipe for chocolate sorbet I have bookmarked, and I probably will have waffle cones to go along with it. So, on the count of three we will all scream, just wait until I leave. It occurred to me the other day that I haven't ever eaten cannoli. Why, you ask? Because it's as if I could picture how it would taste and it never really appealed to my tongue. Going along the lines of "go big or go home", the only place to go is Macri's, the local Italian bakery. 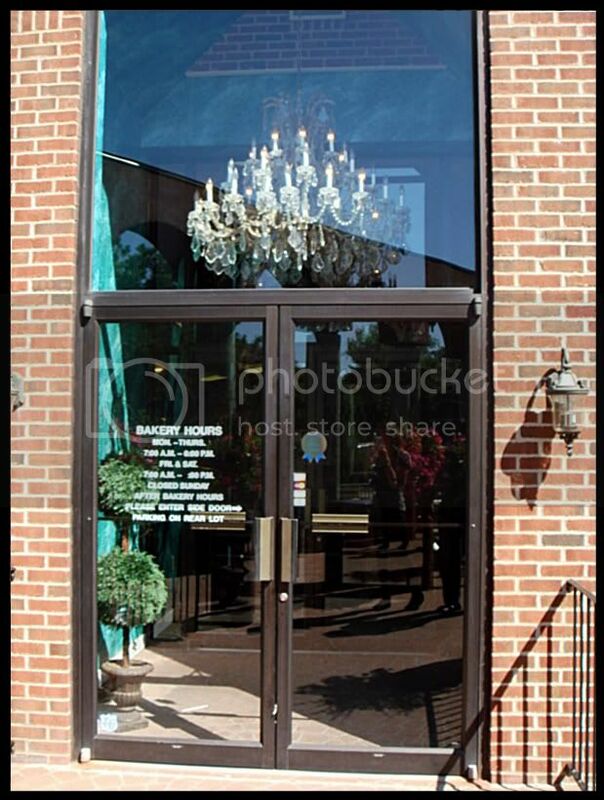 It also occurred to me that I never took a picture of the front entrance, though I'd have to look through the blog archives to be sure. Not only did they offer the regular sized cannoli, but there were miniature versions as well. I didn't (read: forgot) to ask what the filling consisted of so I'll have to assume it was a traditional ricotta filling. 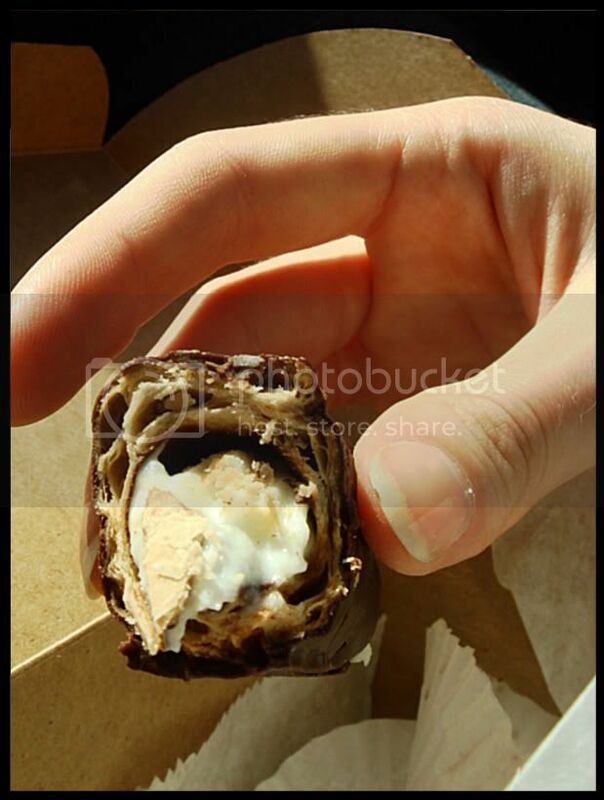 I couldn't pass up the chocolate coated cannolo because it looked like a Chaco Taco! So. Was the cannoli different than my expectations? A little. I was pleased that it wasn't exactly as I thought, though on the other hand I didn't think it was anything too spectacular. The filling reminded me of a less dense cheesecake filling that wasn't airy, yet not so dense you could patch a wall with it. The dough is what made it err on the side of "meh". It was crispy, but in a crumbly way, and rather dense than what I would have expected, sort of like when you eat a pie and the crust seems like it was made with oil, or something. 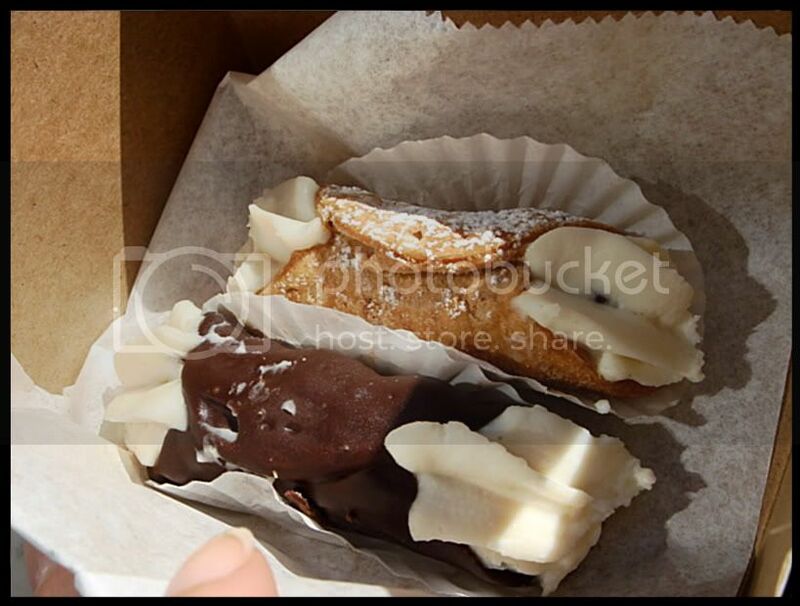 Concluding this post, I realize that I need to try more cannoli in order to reach a more conclusive opinion on whether or not I need to get in touch with my Italian side. 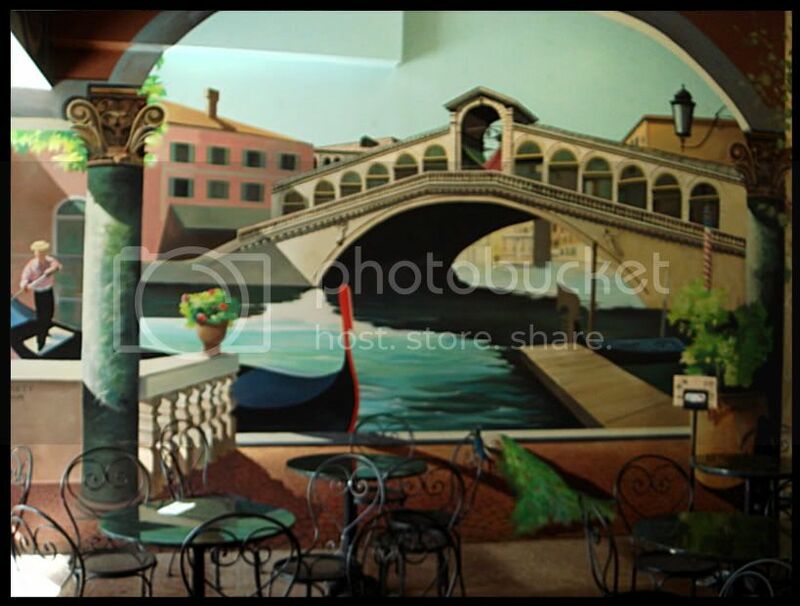 Isn't there a Little Italy in Chicago? 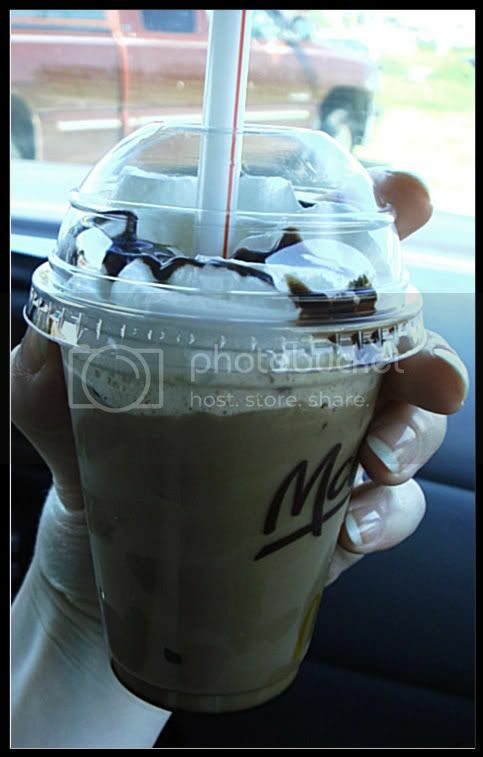 Yesterday, McDonald's gave away free 7 oz. 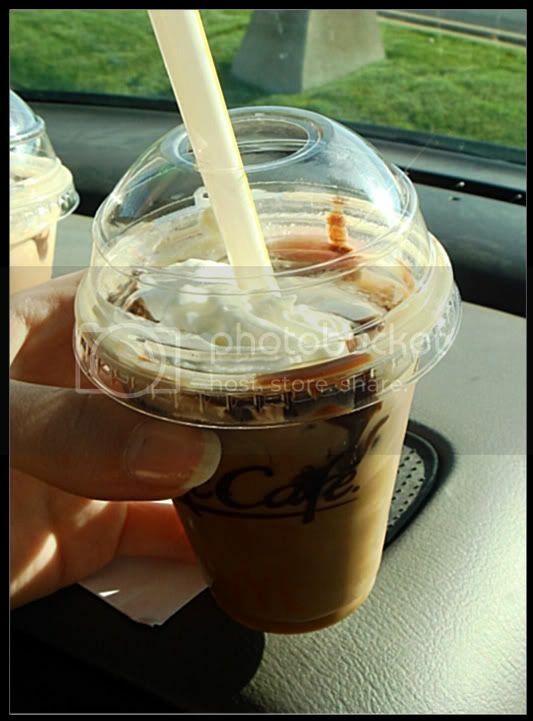 samplings of their iced mocha, in which we partook. Four times. No, we did not mooch, we were testing for quality control. Are all McDonald's associates at various locations equally enthusiastic on "mixology"? Will the comfort of seeing chain restaurants everywhere with the knowledge that no matter where we are, we will be able to get the same exact item prove to be true? First Micky D's we hit up was the 4711 Miami St, South Bend, IN location. 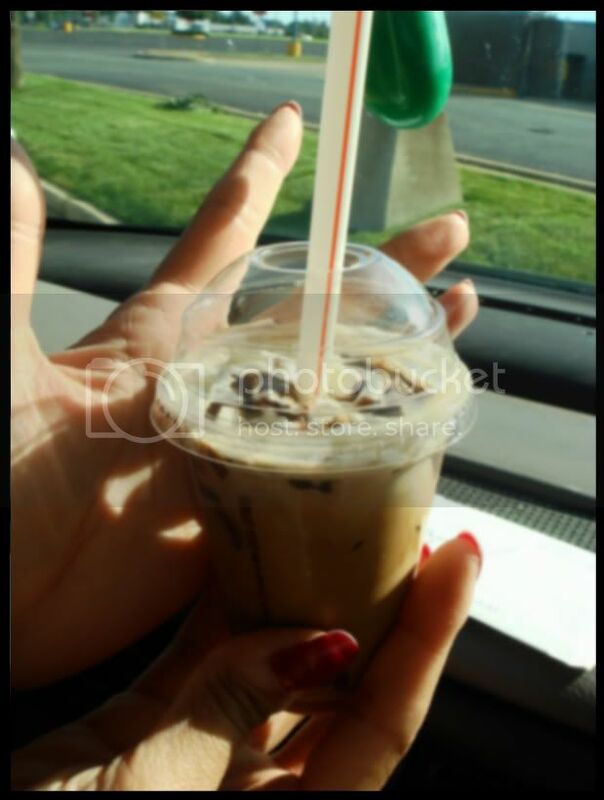 The drink comes in a miniature version of their regular size, which I think is cute. I also think I'm going to order a "short" at SBUX whenever I get a flavored beverage from now on. First sip resulted in a note of edge from the espresso, followed by a chocolaty sweetness that blended together as it should. The drink was chilled enough to make the flavors stand out properly, as well. Nice job. Next stop was the 416 N Michigan St, South Bend, IN location, two from the hospital and the closest to Notre Dame, not to mention where anyone downtown would go if they wanted their fast food fix. After which they could proceed to the hospital. I actually got out to get mine this time, and they were not prepared to place our order. What I mean is that if you are having a free giveaway, you should be set up, but they had to search for cups and other ingredients. Fail. Back in the car, after a picture, it became clear that the punk hadn't any clue how to follow instructions. Way too sweet, and the chocolate tasted powdery. Here is where we got into a banter over how our iced mochas tasted, me saying it was too sweet and didn't have any espresso taste, her saying it didn't have any sweetness and just tasted of espresso, me saying that she's wrong, it's too sweet. Then we switched cups and realized that these were not made the same. Fail again. Fail representation of the impeccable McDonald's standards. Third stop was at 52665 State Road 933, South Bend, IN, another place out of towners might stop at. The landscape at this location was lovely. 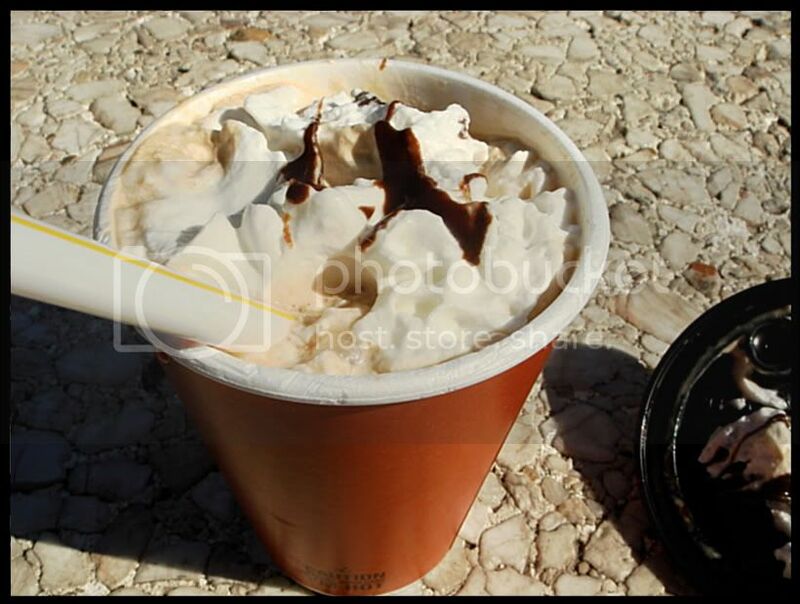 Again, though, for being almost empty, they were not prepared to mix these up and had to go on a search for cups, and they were out of the cups for the iced version. There could not have been a worse iced mocha than the last one, and luckily this wasn't. But it wasn't iced enough so it was like drinking a lukewarm hot mocha latte. Seriously, this is getting troubling. On the plus side, this was the only location where we were asked whether or not we wanted whole or nonfat milk. This did not, however, make up for the wait, but it was interesting to note. 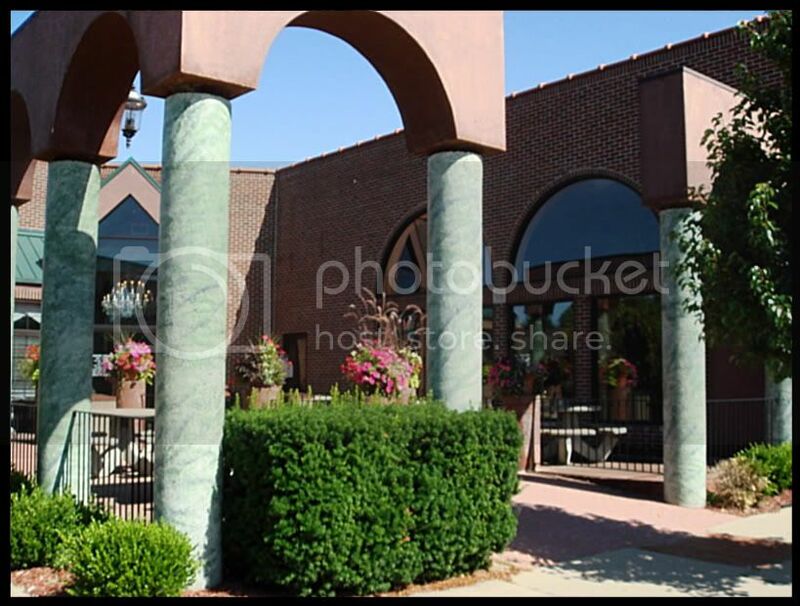 Final stop on our research took us to the 5704 Grape Rd, Mishawaka, IN location. I think. Anyway, the lady who asked us what we wanted kind of gave us a face when she realized we weren't actually ordering anything. Hahah. 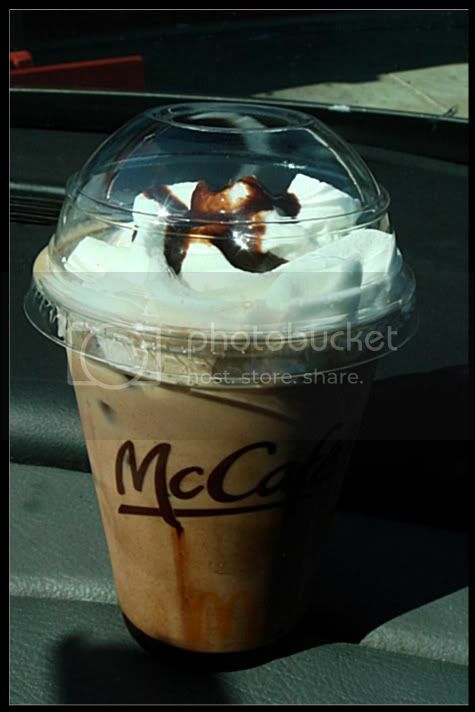 This one didn't quite have enough chocolate sweetness, but it was the closest to the first iced mocha. So there you go, not all iced mochas are made equal. 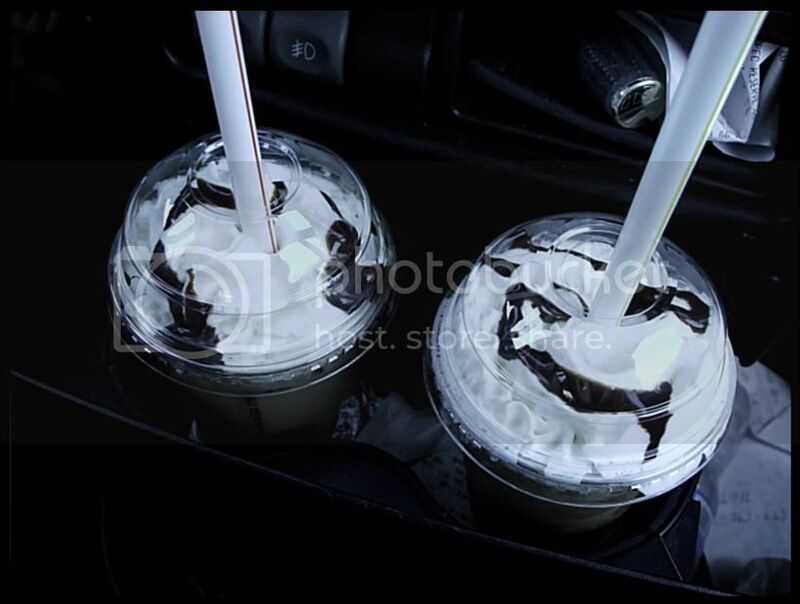 You'll be lucky if you get something drinkable the next time you pull up to a McDonald's with a craving, and this will probably, hopefully, be in the back of your mind. One of my favorite ways to use potatoes is turning it into pillowy mounds of gnocchi. I don't really care for mashed potatoes, although mine are excellent (does it make any sense that I can make well what I don't care for?). The first step is to boil the whole russet potatoes in their jackets. What you have to get past is the humanizing of an edible, akin to the oysters in The Walrus and the Carpenter. All I know is that if I saw something tasty wearing shoes, jackets, whatever, I'd feel a little like a cannibal if I did eat it, which is why I am opposed to tuxedoed strawberries. 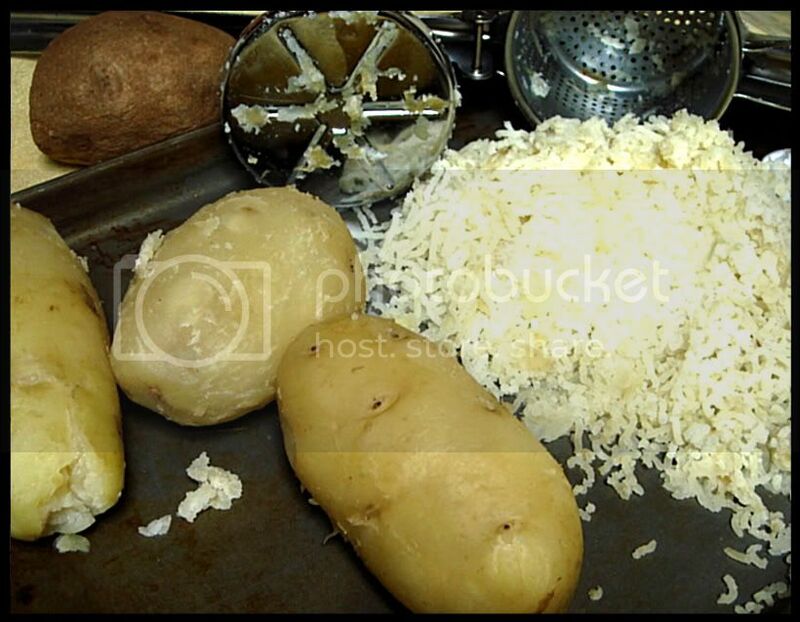 Anyway, after the boiling you peel the potatoes immediately after removing from the pan, then rice it. 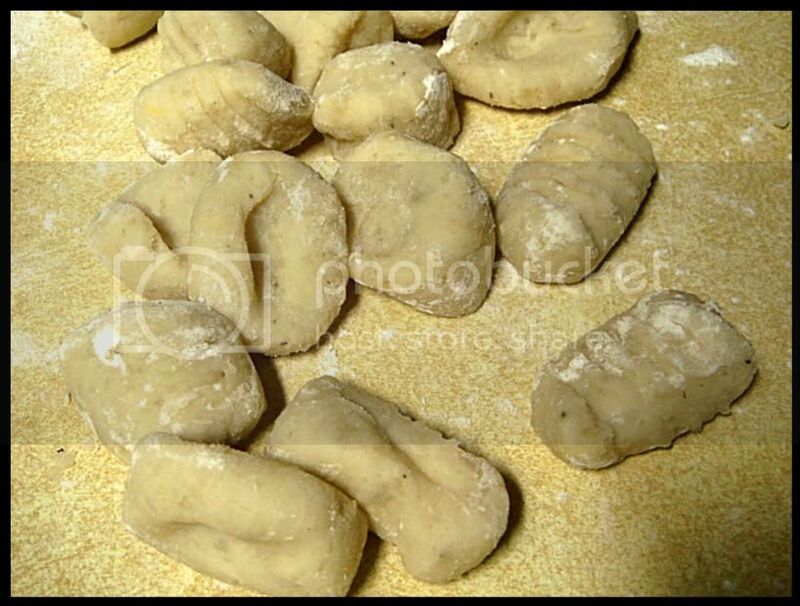 And I swear gnocchi was invented by the Italian mafia since this has to be a form of torture, even if you are wearing gloves or holding the potato by a clean cotton towel. 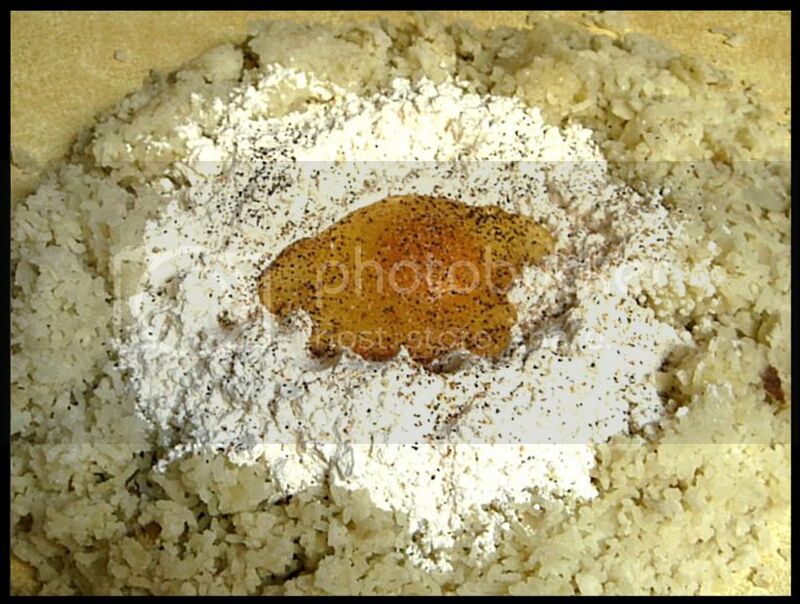 Once the riced potatoes have cooled, you make a well and dump in some of the flour, the salt and pepper, a bit of freshly grated nutmeg (just enough to enhance the potato flavor), and a beaten egg. 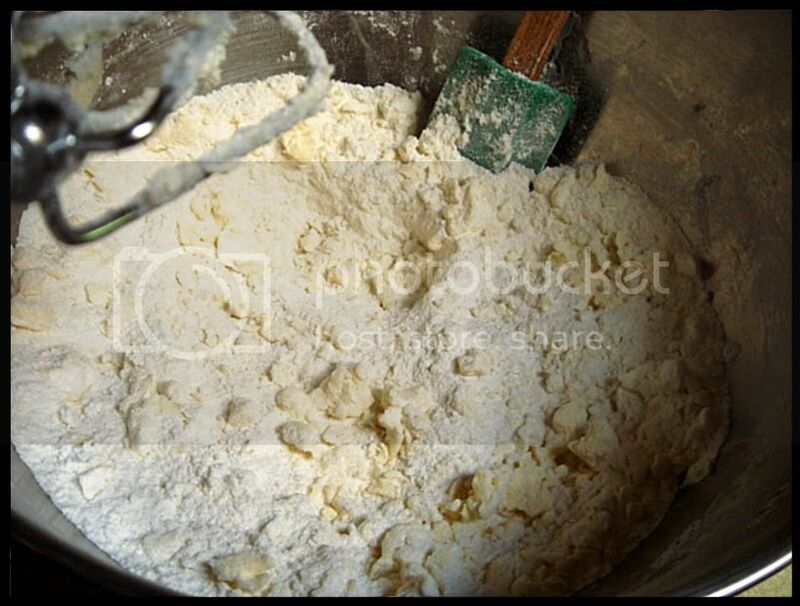 Gather the flour into the egg and draw in the potato a little at a time, ending up with a large mound of emulsified dough that you've kneaded until all ingredients are thoroughly distributed, but not enough to make it overly glutenized. 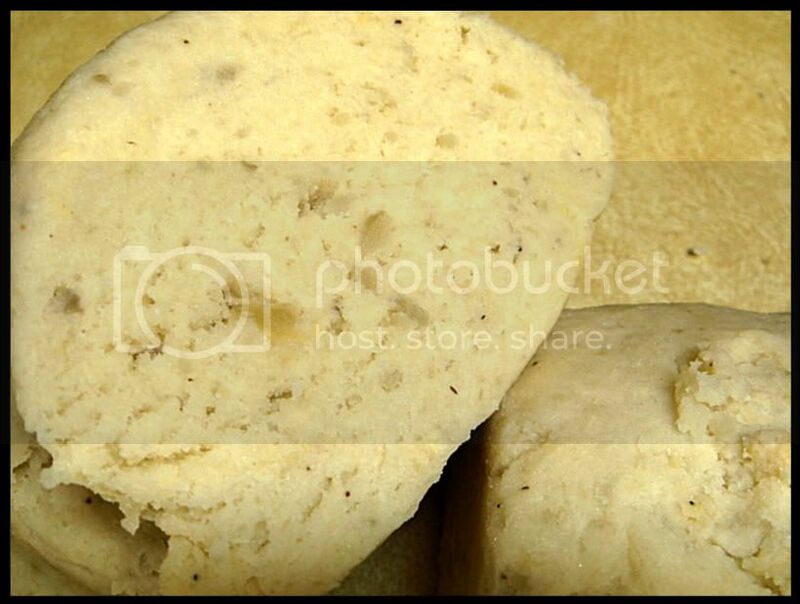 My fake nonna, Lidia Bastianich, says that the correct texture of finished dough should resemble cookie dough with little holes strewn about, and I say it should pretty much be soft to the touch, but not sticky. This woman knows what's up. Slice each half into half to make fourths, then keep the rest covered while you roll out one piece on a lightly floured surface. Slice the log up into evenly-sized "pillows", some recipe say 1", some less, I like making smaller gnocchi because the shape comes out better. Take a piece and roll it down the tines of a fork, pressing down with your thumb, to create ridges on one side and an indent, which I like to refer to as a sauce catcher, on the other side. 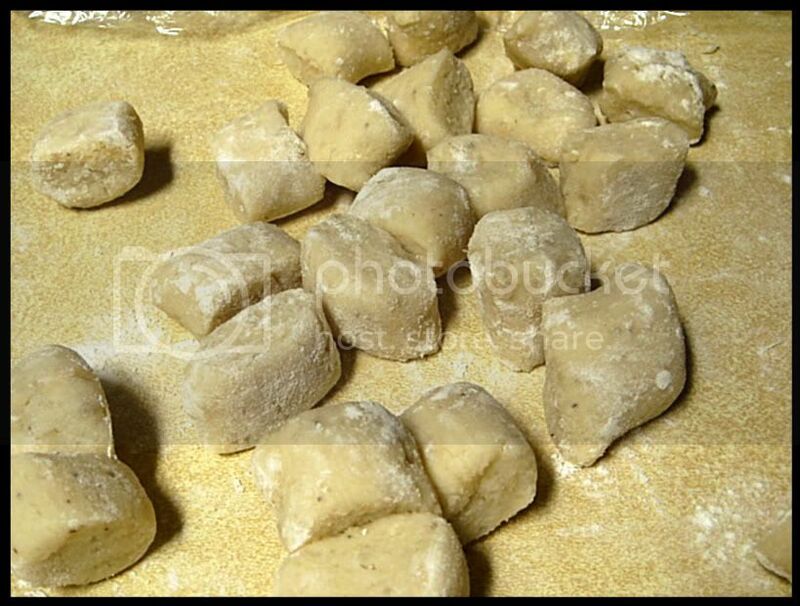 If you aren't cooking these up immediately, place gnocchi in a single layer on a baking sheet lined with wax paper and dusted lightly with flour and freeze until solid. 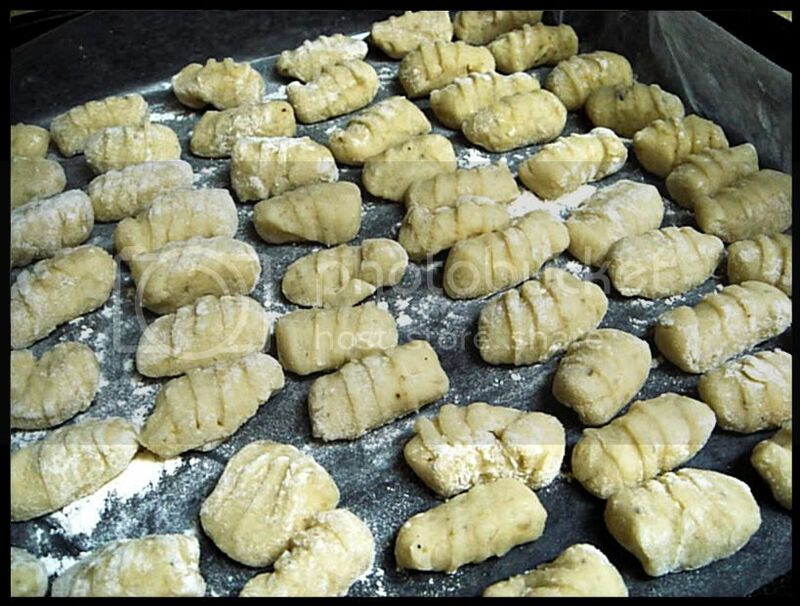 While I didn't use her recipe this time, Lidia Bastianich's recipe is my referral guide as she offers precise instructions for turning out excellent gnocchi, so take a look and read through her recipe, method, and tips here. P.S. I know all recipes say cook for 2-3 minutes, but as I have a paranoia of disintegrating gnocchi I cook them just until they rise to the surface and I'm quite certain it's not 2-3 minutes, I don't know. You may or may not want to listen to me. A long time ago, back in the day, I bought a cookbook for my brothers called Emeril's There's A Chef in My Soup! Recipes for the Kid in Everyone. They've since (and I mean in the span of a few years, now) have cooked and baked up a select few of the recipes, probably because they thought I was hinting at their character. Or something. 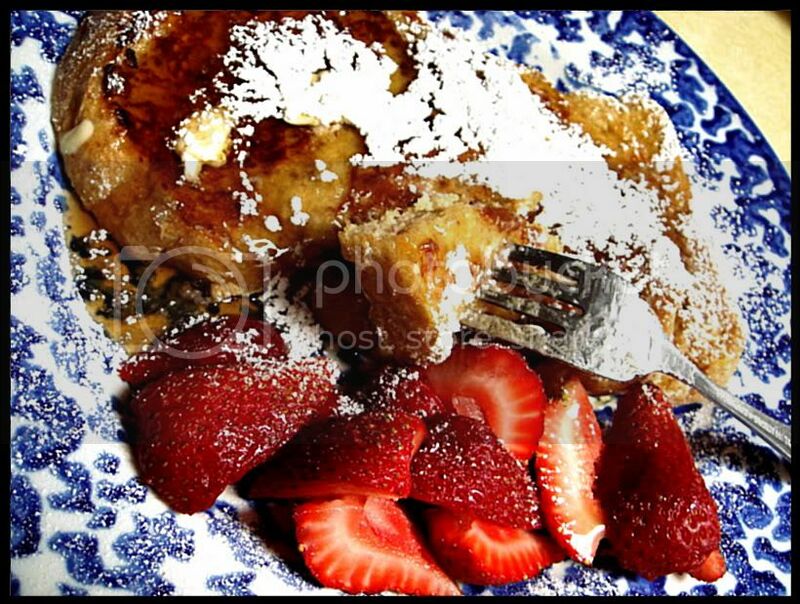 One of the recipes made more than once is the pancake recipe, but I am going to talk about the lesser made but still made more than once recipe, Orange French Toast. I love orange so much that I've been told I need to stop putting orange flavors in about 97% of the things I bake, so it makes sense why this gets tops over pancakes. The custardy base is pimped out with the addition of freshly squeezed orange juice and the grated rind, and I've found out that the addition of a small amount of freshly grated nutmeg enhances the flavor tremendously. Whilst cooking these up (which my brother was making for a late lunch/early dinner) I thought about the Frenched toast recipe from A Homemade Life, Molly from Orangette's book where she talks about how her dad makes French toast. She says the only way to really cook it is in a decent amount of butter, as it helps to caramelize the custard-soaked bread and lends a buttery accent. I should make sure I'm remembering this correctly, though now you can go read the book and find out for yourself if I am, indeed, correct. Seriously, this was a great book that I highly recommend. Anyhow, I didn't remember quite how much butter-per-slice she used, though I just added a decent sliver of butter to the pan with each new slice. As a side note, this should be served almost immediately after removing from the pan because it sort of "falls" if you hold it back, not to mention you're missing that instantaneous crispy hot outtards that you bite through to the silky innards. Second side note, what peeves me the most about when people (and you know who you are -- no, I'm not passively aggressively speaking to my bro) are stingy with the custard and only very lightly dip the bread in so that it gets a light coating instead of the custard being thoroughly infused into the very soul of the bread. Then, you slice into the bread with the side of your fork, revealing the top and bottom layer of custard and the middle layer which is only heated bread. FAIL. In caps. Third and final side note, the heat of the pan is crucial. 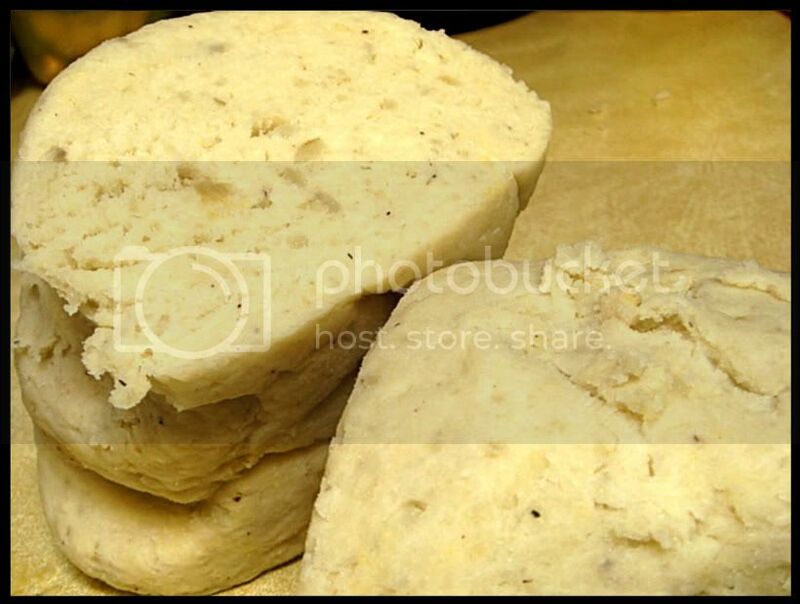 You need to cook the bread over a high enough flame so that the bread won't sit in a pan of butter and become soggy, yet you want it low enough so that the outside won't cook before the inside does. Don't rush it, and just pay attention to the heat as some pans retain heat more efficiently than others. Finally, just eat it. I cannot believe I have this many thoughts on French toast, but I take what I eat very seriously, even ramen noodles. And make sure you dust a decently thick coating of confectioners' sugar so that it won't dissolve before you sit down. Preheat oven to 200°. Heat a skillet (preferably two) over medium heat until hot, about 3 to 5 minutes. 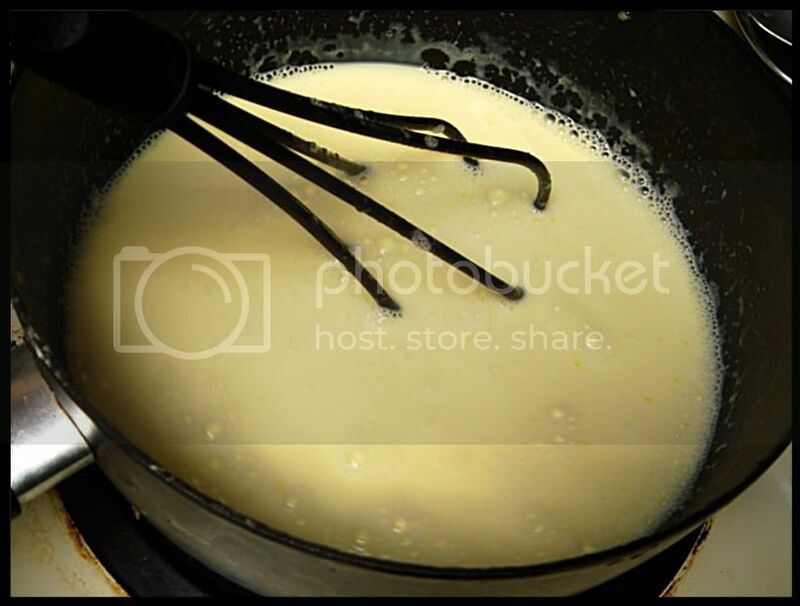 Crack eggs into a large mixing bowl and whisk well. Add the milk, orange juice, orange zest, granulated sugar, vanilla extract, and salt, and whisk until well combined. Melt 1 teaspoon of the butter in the skillet. Dip a slice of bread into the egg mixture, flipping over to coat both sides (make sure the mixture is infused evenly into the bread). 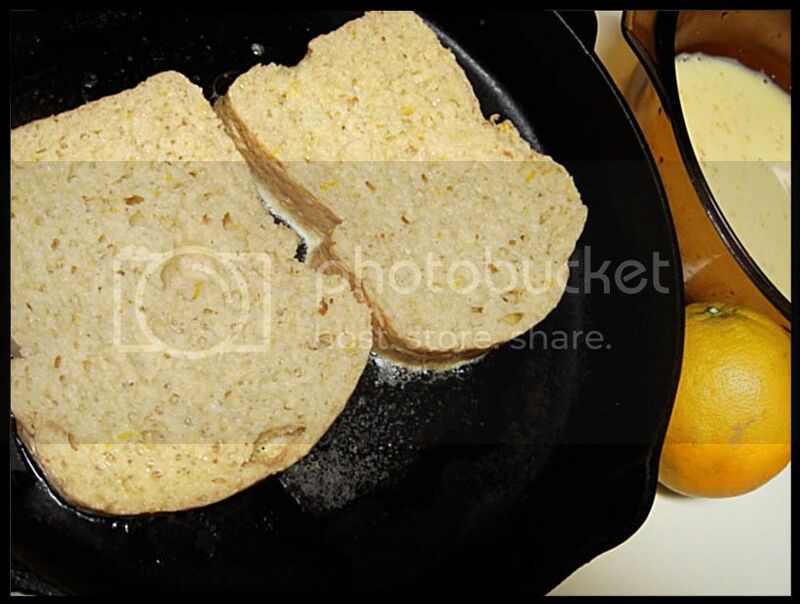 Add a the slice to the skillet, and cook until the bread is golden brown and crusted on the bottom, about 2 minutes. Flip over and cook about 1 - 1 1/2 minutes longer until the second side is golden. 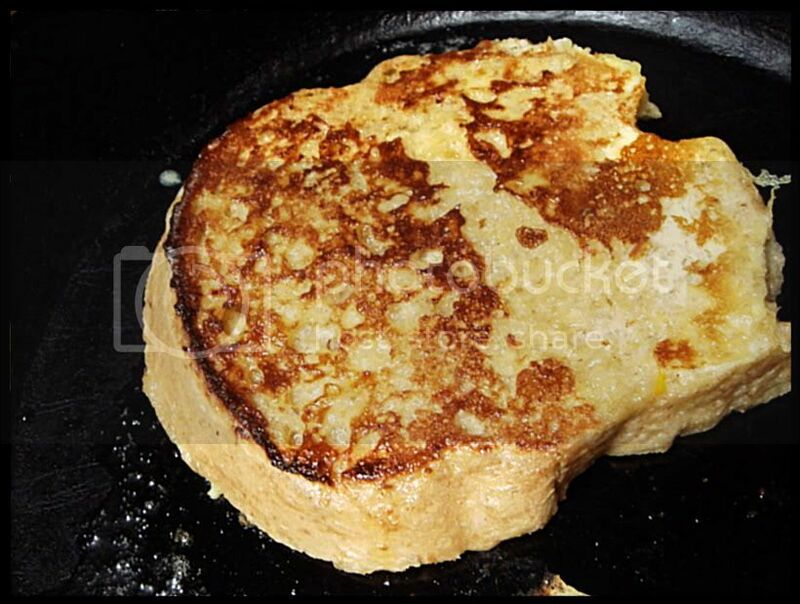 Transfer the French toast from the skillet to a wire cooling rack and place in the oven to keep warm whilst you cook the other sides. Repeat with remaining slices, being sure to add 1 teaspoon butter to the pan before every slice. Sprinkle each plate with confectioners' sugar and serve with syrup. You may be wondering who Billy is and why I'm posting about his cupcakes. 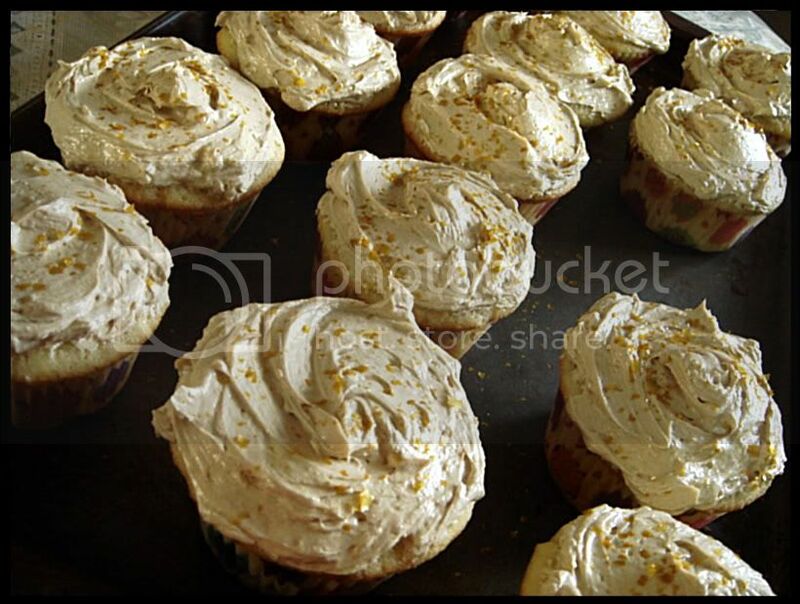 Or you might know that Billy didn't make this particular batch of cupcakes, but he did create the recipe. On a Martha Stewart show about cupcakes, one of the recipes she features was from a guy named Billy who owns two bakeries in NYC. 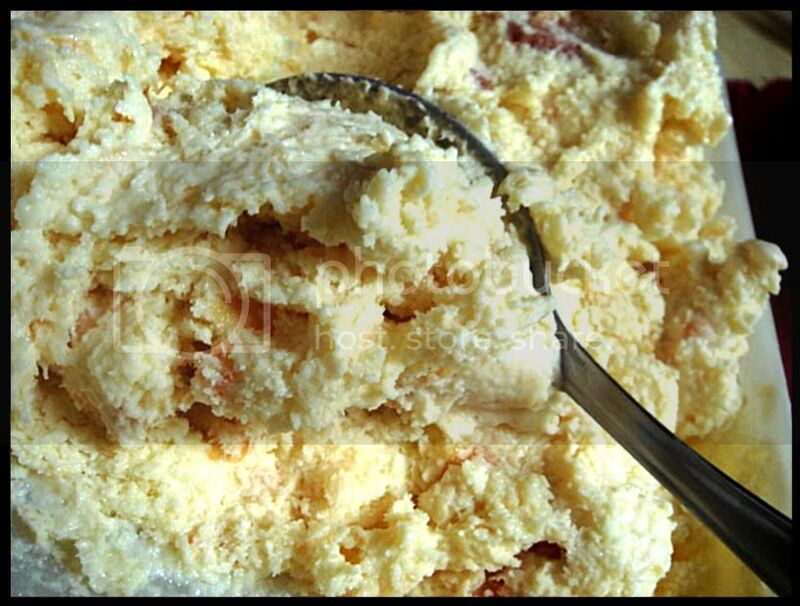 What intrigued me about his particular recipe was his method of combining the ingredients, that method being the butter being beat into the dry ingredients before adding the liquid ingredients. What's the difference between this and the traditional creaming method? Cassie from How To Eat A Cupcake explains in this post of hers, which you won't click until you finish reading mine. Summing it up, I call it the "insurance" method because there's less of a chance of ruining the cake by over-mixing the batter since the development of gluten is delayed. Or something. 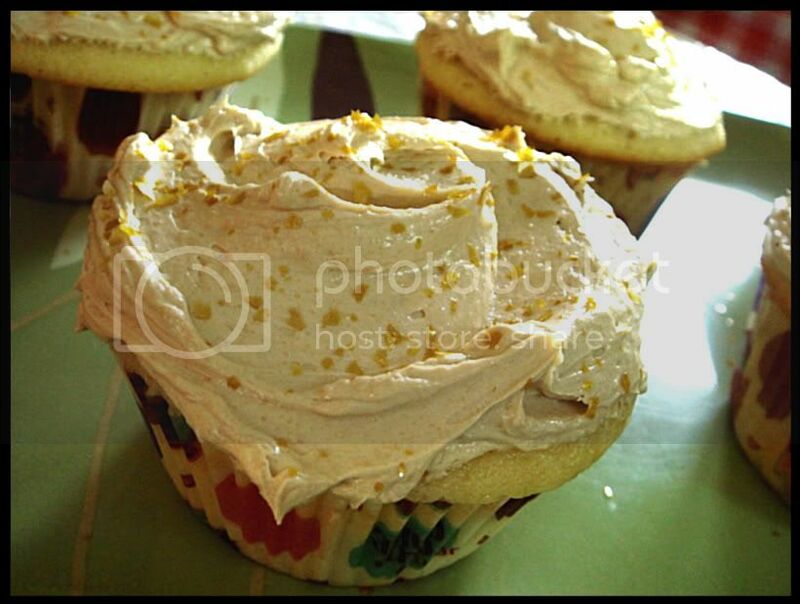 What brings me back to this recipe whenever the desire strikes for vanilla cupcakes is the velvety, billowy texture of the batter. It's beautiful, really, and even if I didn't care for cupcakes at all and threw away the batter after making it, I'd keep making it just so I can stare at the awesome batter. I made these for Father's Day. Instead of frosting them with a traditional buttercream (the recipe that's included with the recipe for these cupcakes is especially good, and it's what makes it the second vanilla since these are actually called 'billy's vanilla vanilla', or 'billy's double vanilla cupcakes') I opted for a caramel espresso Italian meringue buttercream. An Italian meringue buttercream involves making a sugar syrup and beating it slowly into the egg whites before beating in the butter. It's really not complicated, though I didn't let the sugar syrup reach the exact temperature stated in the recipe I followed since it started turning into more of a gloppy mixture than a syrup. I don't know anymore. Sigh. Regardless, the end product was alright. Remembering a tip from Julia Child where she said if you make a mistake, pass it off as intentional since your recipients most likely won't know. What is this saying of your recipients, anyway? Are they that ignorant? Really though, probs what she meant was that most likely whatever the mistake was wasn't that big enough of a deal. UNLESS YOU ARE RUDE AND SERVE THEM SOMETHING TRULY HORRENDOUS AND ATTEMPT TO MESS WITH THEIR MINDS SO THEY FEEL BAD WHEN THEY ASK IF YOU HAD TROUBLE IN THE KITCHEN. Or maybe while the mistake looms large in your mind because you know what it did... Ugh. Would Gordon Ramsay do that, even if it's passable and not truly ruined? In the real world (because Ramsay and his kitchens exist in an alternate universe -- at the end of the universe, even) we don't really have time to remake a wrong. I AM CONFUSING MYSELF. Wait, I didn't tell you what went wrong with these? I'm not going to. Don't you know what Julia Child has to say on this matter? Gosh. 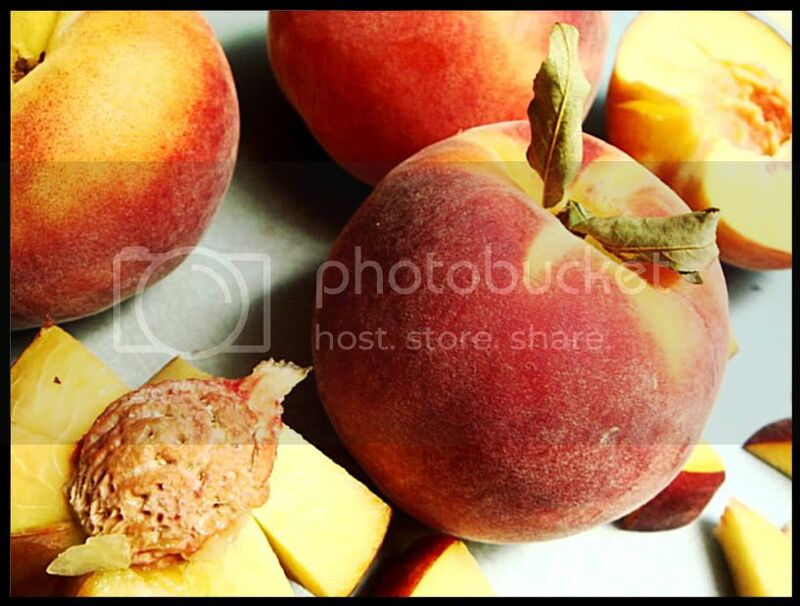 This is the caffeine-induced result of staying up late and editing pictures for a blog post. I hope you enjoy this as much as my brother and I did. Topped with edible gold flakes to add pizazz. I hate that word, it's like a person who has trouble spelling tried to spell 'pizza' and added an extra 'z' and it confuses me. 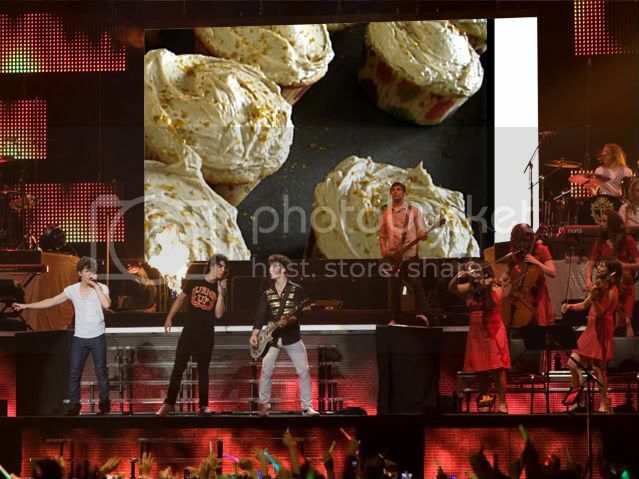 How are these cupcakes? I'm really trying to remember because it's been a while since (SINCE YOU KNOW WHEN!) Father's Day. Pretty much... pretty much I can't put it into words, and I hate that I forgot to take an innards shot, but I think from what I remember is that the crumb is soft, almost melting, and airy while not being open, if that makes sense to any of you. Why would you not serve it at room temperature? I've never once thought of refrigerating cupcakes after frosting so my guests have chilled cupcakes. What does that mean?